Title: Venus and Adonis. Vilia miretur vulgus: mihi flauus Apollo. Pocula Castalia plena ministret aqua. 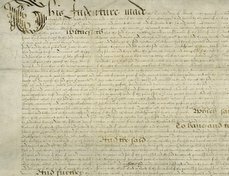 Date: London : Imprinted by Richard Field, and are to be sold [by John Harrison] at the signe of the white Greyhound in Paules Church-yard, 1594. London : Imprinted by Richard Field, and are to be sold [by John Harrison] at the signe of the white Greyhound in Paules Church-yard, 1594. The second edition of Venus and Adonis was published in 1594, only one year after the first edition. The speed with which it was republished suggests that the poem was popular enough to have already sold out or nearly sold out. 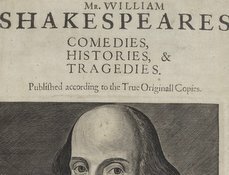 In fact, the poem would go through fourteen more editions before 1640. Perhaps because Shakespeare's Venus pursues Adonis and her own pleasure rather boldly, Venus and Adonis seems to have appealed to contemporary women readers in addition to the witty and urbane young men who usually consumed Ovidian verse. 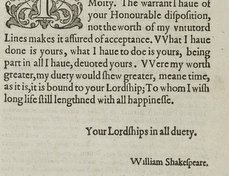 In Thomas Middleton's 1608 comedy A Mad World, My Masters, for instance, a husband reports that he has "conveyed away all [his wife's] wanton pamphlets," (Pearson 88) including Venus and Adonis. 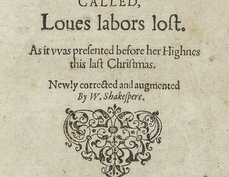 Like the first edition of Venus and Adonis, the second edition was published by Richard Field, also from Stratford-upon-Avon. The volume was, in fact, a copy of the 1594 edition. Shown here, it is one of six known to survive. When Jolley's collection was sold at auction, it was purchased by Thomas Grenville, who in turn bequeathed it to the British Museum. This copy became part of the British Library's collections under the 1972 British Library Act. Thomas Frognall Dibdin, The Library Companion: or, the Young Man's Guide, and the Old Man's Comfort, in the Choice of a Library (London: for Harding, Triphook, and Lepard, and J. Major, 1824). Jacqueline Pearson, “Women reading, reading women,” in Women and Literature in Britain, 1500–1700, ed. Helen Wilcox (Cambridge: Cambridge University Press, 1996), 80–99. Sasha Roberts, Reading Shakespeare's Poems in Early Modern England (New York: Palgrave, 2003). Philip John Weimerskirch, Antonio Panizzi and the British Museum Library, in The AB Bookman's Yearbook, 1981 (Clifton, NJ: Bookman's Weekly, 1982).